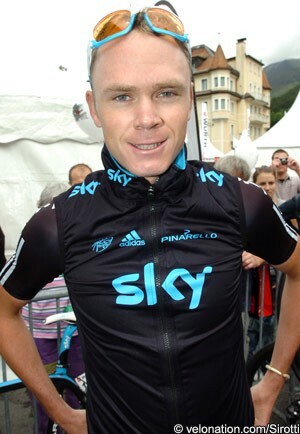 Chris Froome (Team Sky) has racked up steady results all season, including fourteenth overall in the Vuelta a Castilla y Leon and fifteenth in the Tour de Romandie. He has also displayed his time-trial abilities by finishing tenth in the Vuelta a Castilla y Leon TT in April and ninth in the final TT of the recent Tour de Suisse. Furthermore, he impressed on stage seven of the Suisse race when he showed his aggressive riding style by attacking the yellow jersey group, which included Damiano Cunego and eventual race winner Levi Leipheimer. However, these performances were not enough to earn him a spot on Team Sky’s final roster for the Tour de France. The Kenyan born rider has done the French race once before in 2008 with Team Barloworld. His best result again was in the race against the clock when he finished sixteenth on the penultimate day. Speaking to VeloNation this week, Froome said he understands the depth of the team’s squad this year, and knew it would be tough to make the final team for France. He admitted that he was tired after a lot of racing this season and would now focus on being more consistent in becoming a general classification rider, with one eye on the Vuelta a España in August. VeloNation: This is your second year on Team Sky now…are you still happy on the team? Chris Froome: Very. There aren't many teams out there, which are in the same league in terms of attention to detail and support. VN: Do you have a coach, and has your training been similar to last year? CF: Yes, Bobby Julich has been coaching me this year. It's been quite different to last year- a lot more anaerobic work which seems to be working for me. VN: Where are you based and do you have training partners? CF: I moved to Monaco earlier this year which has been a great move. There’s many options for training and lots of other pro riders to meet up with. Goss, Tanner, Cooke, Linus, Gerrans, Porte, to name a few. VN: Have you been happy with your year so far? CF: Yes, it's going well but I've been a bit unlucky with my health recently, picking up a chest infection which seems to be lingering. No regrets, though. I've had some great days and some not so great. VN: How did you find Tour of California? CF: California was an eye opener. I've never been over to the US before, so that was a whole new experience in itself. The tour itself is a fantastic event which I'd like to do again in the future. The change in time zones takes a bit of getting used to, though! VN: What does your racing program look like for the rest of the year, now that you are not going to the Tour? CF: It hasn't been confirmed yet but I'm hoping to do Brixia, San Sebastian, Poland and the Vuelta. VN: What's your short term goals for your career? CF: I want to work on consistency within the tours so I can start targeting the GC more. I've been able to climb in the front group quite often this season but I haven't been able to do it on consecutive days, so that's my next area of focus. It would be great if I could get on top of that before the Vuelta. VN: You were born in Kenya, grew up in South Africa and now ride on a British license. Where do you feel at home? CF: Good question, I'm still working on the answer to that. It always feels like home going back to Kenya but I normally spend the off season in South Africa where I can train properly and catch up with friends. Training in Kenya can be quite tricky with the local Matatoo (taxi bus) drivers and narrow roads! VN: Finally, what is your Tour de France top 3 for this year?